Congratulations Ken! 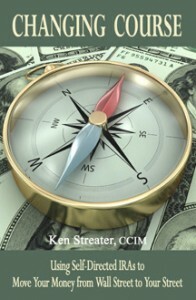 A good friend of our firm named Ken Streater recently released a book on Self-directed IRAs titled “Changing Course”. In the book Ken discusses the Self-directed IRA as the perfect tool to move your investments from “Wall Street to Your Street”. Our IRA owner this month happens to be a Real Estate broker that attended one of our seminars on IRAs and Real Estate. After attending the class it took the broker little thought to understand the opportunities the current Real Estate market offers. She contacted IRA Advantage to create a Checkbook IRA and promptly began the search for her IRA’s next investment. She found the perfect opportunity in an investment home that did not have it’s bathrooms or kitchen completed and thus was not financeable. A deal was struck for a great price based upon the need for a cash purchase and in a great act of compassion there was a side agreement made; upon a future sale 30% of the net profits would be paid to the seller. When the home recently sold the IRA had made a profit of $150k and the home’s original owner was given a check for almost $50k! This transaction is a great example of an investor being able to utilize unique knowledge to Invest in What they Know!